The WheeStat is a potentiostat, which is an instrument used to study electron transfer reactions between species in solution and electrodes. This instrument can be used to teach electrochemistry or to quantify the concentration of some analyte (such as a metal ion) in water. There is a PublicLab wiki page that discusses potentiostats here. The US National Science Foundation supports a digital resource for analysis (the Analytical Science Digital Library, ASDL) which can be found here. The ASDL contains a good collection of electrochemistry resources here. You can purchase a WheeStat from the Public Lab store, here. The history of the project was first described here. Directions for building the WheeStat hardware from a kit are provide here. If working from a kit is too simple, discussions of building one from scratch are provided here and here. While the former note discusses how to build your own pcb, the latter tells how to order the pcb from OSH Park. Some early discussion on the software and graphic user interface are here and here. A discussion of making low cost electrodes is here. Use of the WheeStat and low cost electrodes in monitoring airborne hydrogen sulfide is here. Use of the WheeStat for measuring metal ion concentrations is described here. Setting up your WheeStat: To run the WheeStat, you need to install the appropriate drivers on your computer and have the application file for the GUI installed. For help downloading and installing drivers, setting up your computer, and calibrating your WheeStat, go to this link. Setting up an experiment: The working electrode is where the reaction you are monitoring takes place. It attaches to the black wire lead. We commonly use 0.125 inch graphite rod insulated with brightly colored electrical tape. The purpose of the tape is to prevent the electrode from shorting to another electrode in solution. Between uses, it is a good practice to regenerate the surface of the electrode. We periodically sand it with fine sandpaper and then polish on a sheet of notebook paper. This is the first place to look when the performance of your system diminishes. If material builds up on the surface of your working electrode, you will get poor performance. The counter electrode attaches to the red wire. The counter electrode can be another carbon electrode, or can be made of any chemically inert material. Do not try stainless steel. Despite the name, it will rust. Carbon has the benefit of producing a minimum of bubbles from reactions with water. Buildup of crud on your working electrode will lead to the counter electrode being driven to extreme voltages (up to 1.7 volts), and generation of hydrogen and / or oxygen on the counter electrode. If you see bubbles on your counter electrode, knock them off, then refresh the surface of your working electrode and try again. The reference electrode attaches to the green wire. The most commonly used reference is a silver wire coated wit solid silver chloride and immersed in KCl solution. When not in use, store your reference electrode in a saturated solution of a chloride salt such as NaCl or KCl. Do not allow it to dry out. In order to function, there needs to be a conduction path leading from the silver wire, through the ceramic ball at the base, to the exterior solution. If the ceramic ball dries out, make sure that both the interior of the electrode and exterior of the ceramic ball are immersed in chloride solution. Then give it several days to equilibrate. Similarly, the electrode will not function if you get a bubble inside that separates the wire from the lower part of the electrode. Test Solutions: Electrochemistry requires some solution that exchanges electrons with the electrodes. Typically, this means metal ions in solution. A common ion used to characterize electrochemical apparatus is hexacyanoferrate (FeCN63-, note that their are six CN groups on the iron and the charge on the ion is 3-). Hexacyanoferrate can be reduced by one electron to give the 4- charged ion. Both ions are stable in aqueous solution and the reaction is reversible. While direct electrochemistry can be applied to solutions with analyte concentrations in the micromolar range, we typically work with are ~0.1 mM. It is usual practice to have a large excess of a non-reactive electrolyte like NaCl present in solution as well (100 mM is not uncommon). This electrolyte is added to minimize the effects of convection on the electrochemical response. While the files described above can be used to run the WheeStat, some users may wish to change the functionality of the microcontroller or GUI. In addition, if you are building the potentiostat yourself, you will need to install firmware on your microcontroller board. 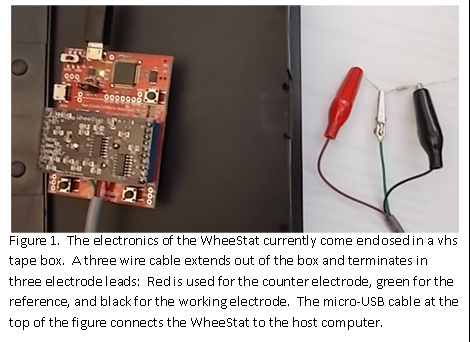 Microcontroller Code: Instructions for downloading the program Energia and installing the microcontroller source code are provided on the page where we describe setting up the WheeStat (here). As of this writing, the most recent version is WheeStat5_4a. You should be able to get this software from our GitHub page (here Let me know if you have trouble with this. I am a little slow on updating software.). GUI Code: The Graphic user interface (GUI) was written using a program called Processing that can be downloaded from processing.org. Source code for the GUI can be downloaded from the same GitHub page, here. As of this writing, the most current version was WheeStat5_4. The graphic user interface allows the user significant control over experiments and allows the user to see the results in real time. A screen shot of the GUI displaying data from a performance test is below. Across the top of the GUI are a number of inputs and outputs. From left to right, you see a dropdown that allows the user to specify the communications port that the instrument is connected to. Once the com port is chosen, the user clicks on the "connect" button to connect the GUI to the instrument. To the right of the connect button is a text box that indicates that the experiment is finished. To the right of the text box is a dropdown that allows the user to specify the experiment. In this case, the "RAMP" experiment was chosen. Other options include cyclic voltammetry, normal pulse voltammetry, differential pulse voltammetry, stripping voltammetry (both annodic and cathodic) and one- and two-pulse chronoamperometry. To the right of the experiment dropdown is space where error messages are displayed. At the far right on the top is a button allowing the user to save the collected data to a file that can be opened using excel. Below the com port selection dropdown are a series of text boxes that allow the user to input such as the initial and final voltages, current gain and offset, initial delay, and scan rate. Beneath the text boxes is the Run / Stop button. The majority of the GUI is devoted to a graphic data display that shows the user the experimental data in real time. Above the data display is a dropdown that allows the user to chose whether or not to overlay sequential voltammagrams. To the right of the data display is a multi-colored bar that shows the user what fraction of the A to D converter's dynamic range is being utilized. In the screenshot above, the current data range was outside what could be provided and be measured by the instrument. This can be seen by the "flat-lined" current data at the upper and lower ends of the voltage range. It is also reflected by the full extension of the bar over the range limited by the thin white lines at the top and bottom. By decreasing the current gain, the full range can be observed. The figure below shows the data at the opposite extreme, where the gain is too low and significant noise is introduced into the voltammagram. Checking the limit bar, it is easy to see that only a very small percentage of the instrument's capacity is being utilized and that the gain should be increased. The following video shows the setup of the GUI and some of it's functionality. 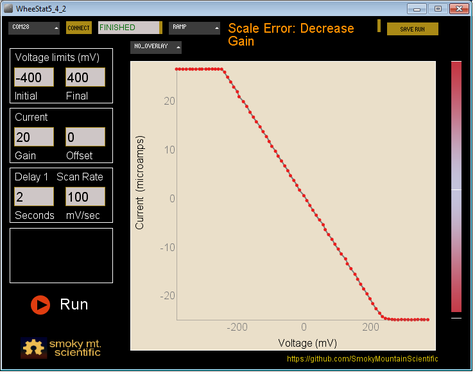 It shows the expected behavior of the instrument, tested using a resistor of known value. The demonstration shows that Ohm's Law can be used to predict the current / voltage behavior of the voltage ramp experiment. FeCN63- + e- <==> FeCN64- (1) Data from such an experiment employing the iron(III) compound, FeCN63- is presented in Figure 3. The electrical current passed to the electrode is presented in Figure 3 as a positive current that decays with time. To understand current response using other voltammetric techniques, it is necessary to understand the origin and nature of this decay. Just after the potential step, there is a great excess of the iron(III) compound close to the working electrode, giving rise to a large current. As time evolves, the amount of iron(III) available for reaction diminishes and subsequently, the electrical current decays. The current / time profile in chronoamperometry experiments is governed by the rates at which compounds reach the working electrode. In an unstirred electrolyte solution, the current is determined by the rate at which the compound diffuses. For a planar electrode under these conditions the current is described as a function of time by the Cottrell equation (since I cant figure out how to write equations in this format, click this link). : Note that all the terms in the Cottrell equation are constant with the exception of the current and the time. Thus, the current is expected to be proportional to one divided by the square root of time. Analysis of data (Presented in Figure 1) shows that this was the case. Experiment 1B. Double step chronoamperometry. 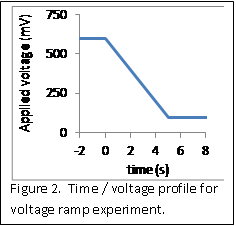 Figure 2A shows the time / voltage profile for a double potential step experiment. In this experiment, the voltage is stepped from the initial voltage to a second voltage and then back to the initial voltage. Current data is collected after each of the two steps. Experiments for Teaching Electrochemistry: 2. Normal pulse voltammetry: . A normal pulse voltammetry experiment consists of a series of voltage pulses with varying heights. It is described here. 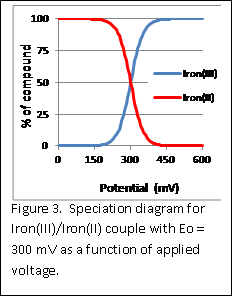 For our discussion of chronoamperometry, we assumed that the iron(III) form of the compound was the only species stable at the initial voltage and the iron(II) form was the only one stable at the second voltage. At intermediate voltages, however, both oxidation states exist at equilibrium, with their ratio determined by the Nernst equation: E = E° + RT/nF ln([Fe3+]/[Fe2+]) (3) Where E is the applied voltage, E° is the standard reduction potential of the couple, R is the ideal gas constant, T is the absolute temperature, n is the number of moles of electrons transferred and F is the Faraday contant. Thus, Equation 3 tells us that the applied potential (E) and the standard reduction potential (E°) determine the position of the equilibrium mixture of oxidized and reduced species. The relationship that the Nernst equation predicts for a Fe3+ / Fe2+ couple with an Eo of +300 mV is presented in Figure 3 . In this figure, the red line represents the percentage of an Fe2+ ion and the blue line represents the percentage of Fe3+. Notice that at a potential of +150 mV, nearly all the compound exists as the reduced, Fe2+ state, at +300 mV (the Eo for the couple) the mixture contains 50% of each, and at +450 mV, nearly all is in the oxidized, Fe3+ state. If we start a single step chronoamperometry experiment at a voltage where only the iron(III) form is stable and step to a voltage where both the forms coexist, we expect the shape of the current profile to be similar to that in the above case, but at a lower total current, as the electrical current only passes to achieve the equilibrium condition, and not to total reduction of reactant. The normal pulse experiment illustrates how the chosen step potential affects the current profile. In this experiment, a series of voltage steps are generated at incrementing potentials, as shown in Figure 2A. Unlike the case for chronoamperometry, however, the current in normal pulse voltammetry is only sampled once per step, at fixed time after the step is initiated. The current sample times are illustrated as the red circles in Figure 4A. Results of this experiment are plotted as the measured current versus the voltage at which the current was measured. Figure 4B shows a screen shot of normal pulse data obtained using the same solution as that from Figures 1 and 2. Figure 4C shows an analysis of the data from figure 4B. In this figure, original data are presented as open diamonds and the model is shown as a solid blue line. The data were treated by assuming (1) a linear baseline drift (caused by uncompensated solution resistance and double layer capacitance) and (2) that Nernstian conditions were established and maintained for the duration of the pulses. Comparing the predicted and observed results indicated a good fit of the data. Experiments for quantifying redox active stuff: Differential Pulse Voltammetry (DPV): The problem with normal pulse voltammetry is that it is a very time consuming experiment if done right. This is because it is necessary to establish the initial solution conditions at the working electrode between each voltage step and also because non-Faradaic processes (double layer capacitance and solution resistance) are significant contributors to currents for these large steps. Differential Pulse Voltammetry does not suffer from these problems. The technique is described here. A variation on the differential pulse theme: Stripping voltammetry Stripping voltammetry is discussed here. A good laboratory experiment, with step-by-step directions for quantifying lead in water is here. There is a table of elements in this reference that can reportedly be determined by ASV. Unfortunately, the author does not list his source. Anodic stripping voltammetry (ASV) is a technique that can be used at very low concentrations if the product of reduction is not soluble. For example, if you reduce Cu2+ ions to Cu metal, the metal that is deposited on the electrode stays on the electrode. When this is the case, the analyte can be "pre-concentrated" on the electrode, making it easier to detect during a subsequent analysis step. The WheeStat is set up to do ASV using differential pulse voltammetry during this analysis. The difference between the ASV experiment and the DPV experiment has to do with what goes on before the analysis step. In DPV, you typically hold the voltage at the initial value for a couple of seconds to establish conditions surrounding the electrodes before proceeding. In ASV, you use the pre-analysis time to prepare the electrode and deposit the analyte onto the electrode surface, thereby pre-concentrating it. The WheeStat ASV experiment was written assuming that you will deposit a mercury film on the surface and will remove the film between experiments. Thus, it starts with a "cleaning" step where the voltage is held at +400 mV to remove any mercury remaining from the last experiment. It then steps to the desired initial voltage for the specified delay, followed by a quiet time. The WheeStat is also set up to signal an electric motor to agitate the solution during the electrode cleaning and deposition times (we expect to describe running a vibrating coin motor off of the WheeStat to agitate the solution soon). More information on the ASV experiment and its application to quantifying copper and lead can be found here.